Seven little words: where there’s a will, there’s a way. They describe the difference that Bauporte wants and can make in a global market that offers ‘a lot of the same’. That difference starts with our staff. Their faith in their own abilities is key in that, as is the iron will to work hard on our collective mission: maximum customer satisfaction in the art of an entrance door. The difference is also in our clients, who consciously choose high-quality custom-made designed entrance doors by Bauporte. Our clients are all enterprising parties who don’t give up easily and want to get all they can out of materials and designs to position themselves. Where there’s a will, there’s a way. 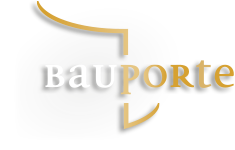 Bauporte was founded on this motto. Drawing up designs, setting goals, pulling up sleeves, and showing willpower. This is what our clients, our staff and our organisation are all about. The collectively binding factor, our ‘roots’, can be summed up in those seven words.